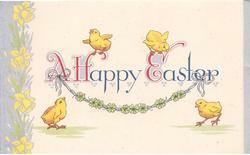 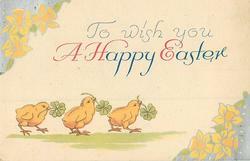 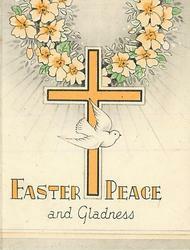 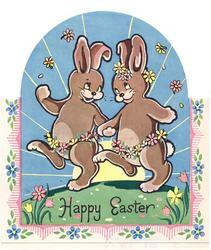 inside right: MAY EASTER JOY AND HOPE AND PEACE ... BRIGHTEN ALL YOUR WAY! 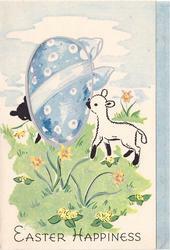 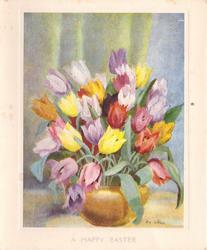 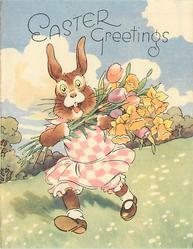 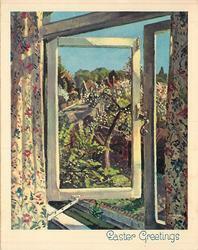 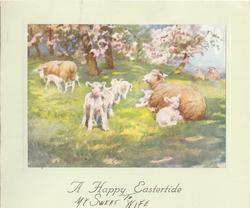 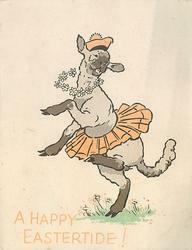 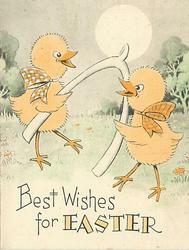 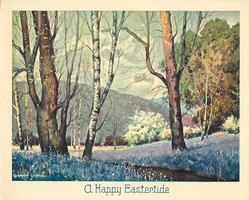 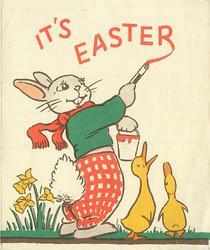 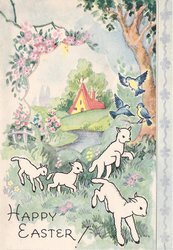 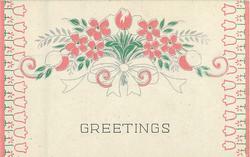 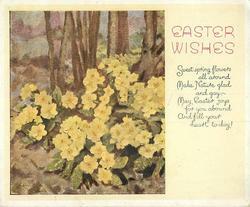 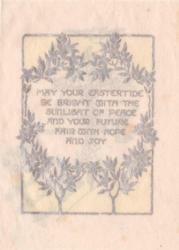 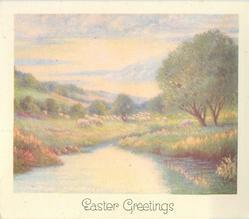 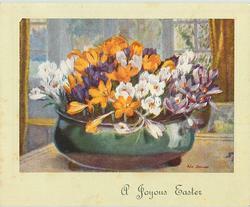 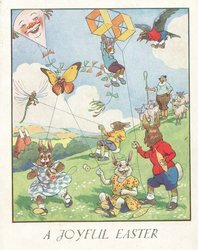 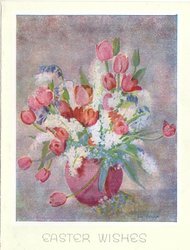 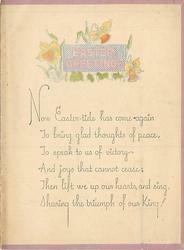 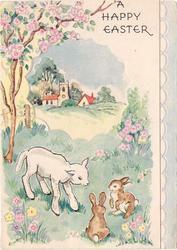 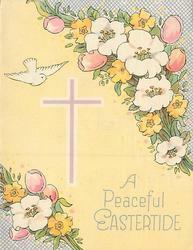 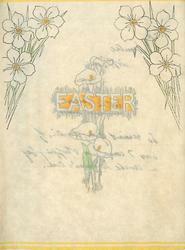 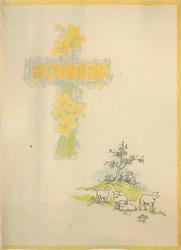 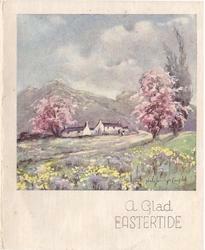 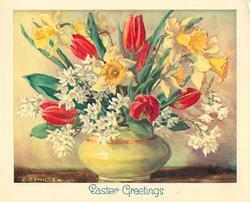 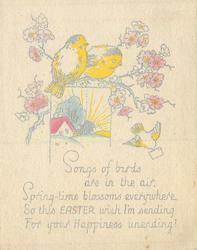 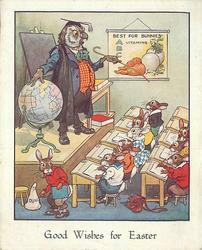 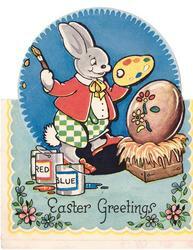 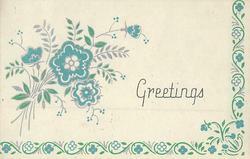 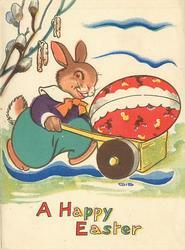 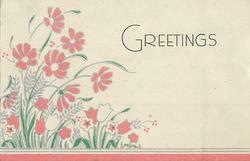 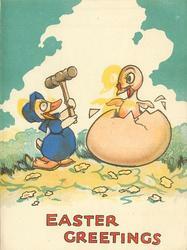 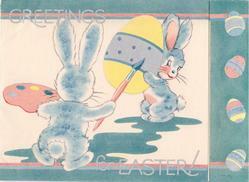 inside: MANY A JOY AND PLEASURE MAY EASTER BRING TO YOU, SUNNY HOURS, SWEET SPRING FLOWERS, SKIES OF CLOUDLESS BLUE! 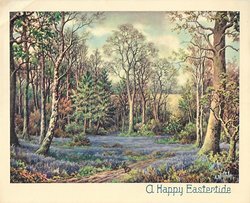 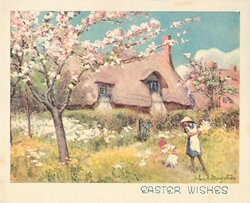 inside right: SWEET SPRING FLOWERS DECK THE EARTH, 'TIS THE TIME FOR JOY AND MIRTH, HERE'S A LITTLE WISH FROM ME - HAPPY MAY YOUR EASTER BE! 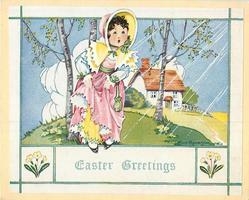 inside right: SPRING IS IN THE AID TO-DAY ... NOW AND THE WHOLE YEAR THROUGH! 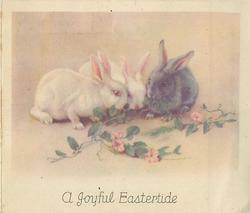 inside right: THIS LITTLE BUNNY'S FEELING GAY JUST BECAUSE IT'S EASTER DAY ... GOODLUCK THROUGHOUT THE YEAR! 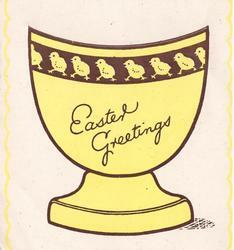 inside right: HIP, HIP, HIP HOORAY! 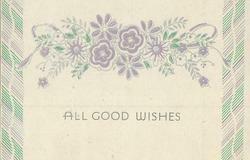 ... AND BEST OF LUCK THE WHOLE YEAR THROUGH! 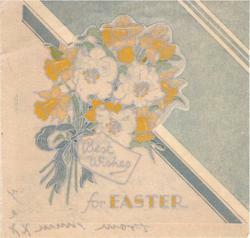 inside right: SENDING BEST WISHES TO YOU FOR A JOYOUS EASTER! 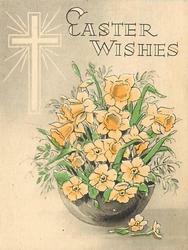 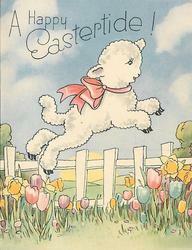 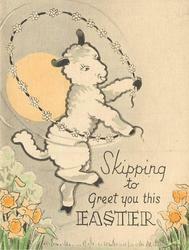 inside left: WISHING YOU JOYS THAT INCREASE BY LEAPS AND BOUNDS THIS EASTERTIDE! 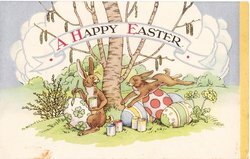 inside: THE SUN SHINES BRIGHT, THE FLOWERS ARE GAY, NOW EASTERTIDE IS HERE; I WISH YOU HAPPINESS TO-DAY, AND LUCK THROUGHOUT THE YEAR! 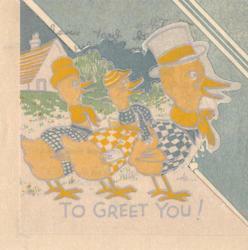 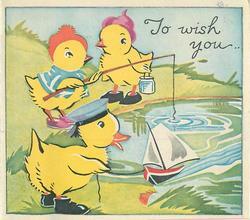 inside right, silvered: A HAPPY EASTER THESE LITTLE DUCKS HAVE COME TO SAY, "WE WISH YOU JOY THIS EASTER DAY ... AND HAPPINESS YOUR WHOLE LIFE THROUGH!" 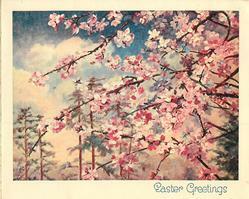 inside right: TREES ARE BUDDING FRESH AND FAIR ... A TIME OF GLADNESS DEEP AND TRUE!